This was posted on Kiwibiker tonight - some awesome footage! So after an early rise (man, it's Saturday!) I rode down to meet Brian and Manie (riding down from Normanby on his K6 Bandit) and a few other local riders at Freedom Suzuki. After filling in our entries and chatting with others it was time for us to ride up to Hunterville to the official start of the ride. In Hunterville we gassed up and completed our sign-on before grabbing a quick coffee prior to the ride briefing. While waiting Al turned up on his Tigger and Colin (from the BRR) on his Wee - both keen to ride Annie again. Soon we were on the road again and after a quick re-group at Taihape it was onto the Annie itself. With a lot of different bikes on the ride and riders of different riding styles we pretty soon spread out and people could ride at their own pace. The road is definitely seeing some use as it is getting a bit broken up in places and there was the usual loose metal in a number of places. 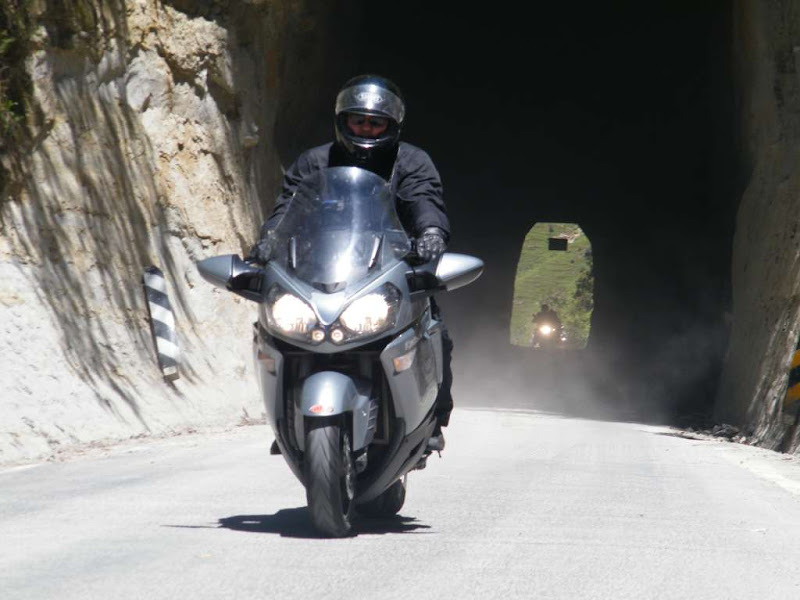 This road is a fantastic ride (for it's scenery and it's hills and corners) but it is certainly one that needs to be ridden with some caution. I got separated from Brian, Manie and Al for a while as a another biker had a whoopsie while pulling over to let others past - poor guy, trying to do what's right and getting a kicking for it! Al eventually caught me up near the front of the ride but eventually went past as I settled into a slower pace as we neared the more demanding, windy and poorly surfaced sections. But further on he actually came back the other way - he had noticed that the bike that had been following him had disappeared from his mirrors and fearing the worse turned around to make sure that he was ok. Apparently the guy had pulled of the road for a breather so all was good and Al was able to then catch me up and follow me into Fern Hill. Here we waited for a while but with the other riders still somewhere on the Annie we carried on into Hastings to our lunch stop and managed to get a head start on the sossie eating. Actually, not long after we arrived the rest of the mob started coming in in dribs and drabs all drawn to the smell of the barbie I guess. After lunch it was time for a prize draw and to my delighted surprise I was one of the lucky recipients of a Freedom Suzuki gift voucher! Awesome, thanks Barry (that's him on the left in the picture above)! The ride from here was to take in SH50 and then SH2 back to Palmy and then Hunterville for a bit of a get together but as Manie had to get back to the 'naki we took the opportunity to sneak away a bit earlier than the rest and just head for home. Had a wee look at the new Wee today and it is a very nice looking bike and bound to be a load of fun. It is a bit of a shame that they haven't been able to move the oil filter as it's still pretty vulnerable sticking out the front (just like on my Vee, although it at least has a bit of protection in the form of it's belly pan) although there is no oil cooler there as well like on the Vee. At the Grand Challenge the Connie was scrutinised prior to the ride and the guy checking my front pads mentioned that they were getting down. I already new this as I know that they last around 25,000km and the bike was sitting on about 74,000km - but I had checked before leaving home and they looked pretty good. 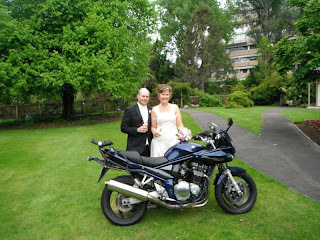 Actually when the guy had another look from a better angle he also agreed with me and the bike was passed as fit for it's 1,000 miles in 24 hours - phew! But riding it on the weekend (for it to complete it's Best Bike duties) I was starting to get the odd squeak from the front end - time for those new pads eh? So tonight was the night and here's a few pics of the job. And finally pad removal - 7 to go! With 8 pads to do it is a bit of a fiddly job and took me (a ham fisted, strictly amateur mechanic) around half an hour to do. I then brought a light in closely and checked those pads were around the right way and called it job done! Now we'll just have to go for a pootle this weekend and see if they work eh? I did get a little ride in though and still had a good time (except for sweating through a speech). 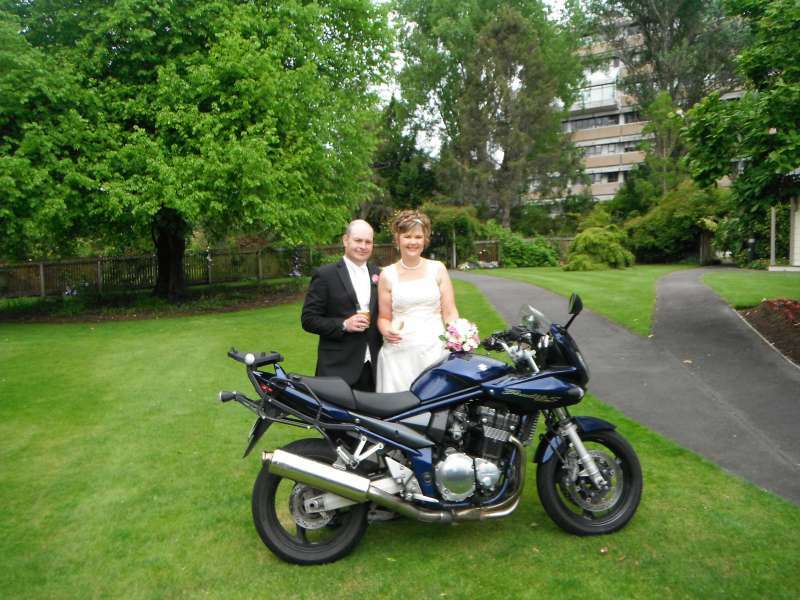 Congratulations to Mark and Shelley and I hope the Bandit behaves itself on the honeymoon! On Saturday I realised I hadn't ridden a bike since Monday and that was obviously not cricket at all so it was time to fire up the Vee and go looking for gravel again. While I was fluffing around getting ready I decided that I wanted to revisit Pori Road which I had last ridden with the Back Road Riders in June as part of their Waewaepa Wanderings ride. I remembered the great climb up the hill and some fantastic scenery which I didn't get a chance to photograph. Excuse the poor map - Google Maps refuses to believe that Pori Road is not a dead end...and I didn't download my GPS track (doh!). To get to Pori Road I first took to the Pahiatua Track and it was here I first hit some pretty serious wind. The Vee is a fair bit lighter (and possibly a bit more top-heavy) than the Connie and I found myself getting blown around a fair bit. But I managed to stay on the road to my first stop at Pahiatua for fuel. Gassed up it was time to head for Route 52 via Mangaone and Pa Valley Roads. These roads wind through great dairy country (mind those cow crossings) and you eventually pop out on Route 52 just North of Alfredton. At Route 52 I turned left and rode about another 4-5km to the Pori Road turn-off. The first bit of Pori Road takes you "up the hill" and you eventually end up winding your way around the side of the hills on a very narrow road with great views out to your left. After a quick stop for some pics (more here) I carried on up the hill and ignoring the turn-off to Puketoi road which had proved so exciting last time (actually the road was closed so who knows how bad the mud is through there at the moment) and started riding the remainder of Pori Road that I didn't get to ride last time. Eventually the road actually becomes sealed and takes you onto Pahiatua-Pongaroa Road - right for Pongaroa and left for Pahiatua. 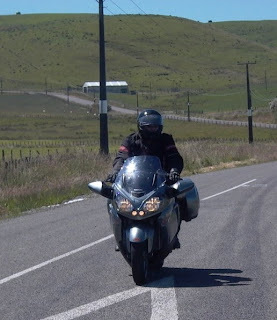 I managed to stop myself from going right to take in some more great riding and turned left for Pahiatua and home - once again battling the high wind on the track. 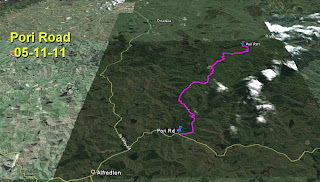 I've just been playing with Google Maps and my GPS tracks to create a bit of a timeline for the Grand Challenge. Most of the times have been taken off the GPS tracks except for Opotiki where I was missing some information but I know I arrived there at about 20:30 and have a fuel docket with 20:38 on it (I was interviewed on camera when I arrived and started to fill up). Distances are from Google Maps except final GPS odometer reading. 13:00 Depart Turangi (Points A & G). 15:42 Fueling up in Wairoa, quick bite & drink. 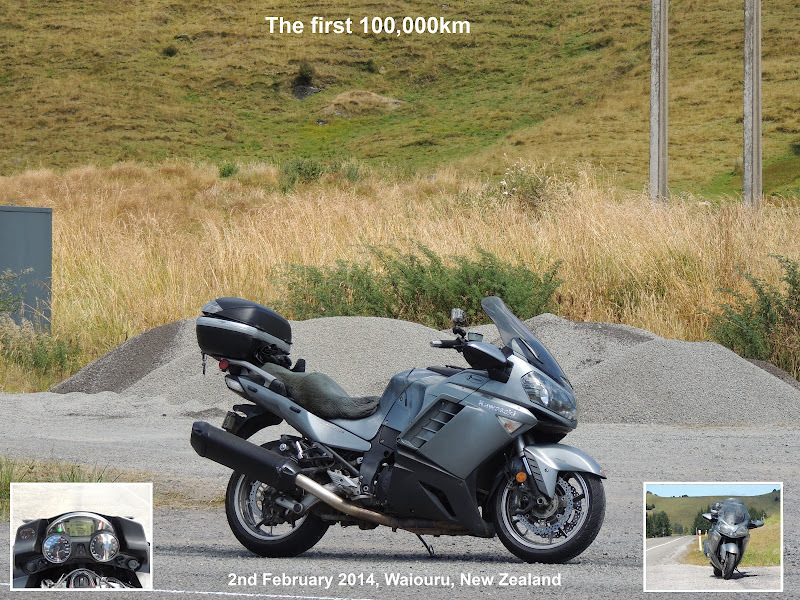 17:38 Checkpoint 1, Tokomaru Bay (Point B), pit stop, drink, bite to eat, 461km. 20:30 Checkpoint 2, Opotiki (Point C), longer pit stop, fuel, interview, pie, drink, 696km. 23:28 Fueling up in Wairoa, gas and go. 00:55 Checkpoint 3, Havelock North (Point D), pit stop, drink, bite, no fuel, 1,065km. 03:32 Checkpoint 4, Eketahuna (Point E), punch card and go, no fuel, 1,250km. 05:17 Taihape, fuel, quick drink and bite. 06:21 Checkpoint 5 (Fields Track, SH4 intersection), punch card and go, no fuel, 1,472km. 07:30 Arrive Turangi (Points A & G), 1,619km (GPS). So, nine stops in all (and these are what kill ya times) but these had to be planned around fuel availability and of course the checkpoints were compulsory. I could have made it from Opotiki to Napier/Hastings on a tank and so missed out the second fuel stop in Wairoa but that may have fouled things up for what would have been the next two fuel stops to get home - I made have needed to make a diversion to find stations that were open. All in all I'm pretty happy with how the ride panned out and my 18.5 hour time - well within the allowable 24 hours!